Recently I discovered that my local Costco started selling uncut USDA prime bone-in short ribs for just under $5 a pound. That is an absolute steal, because many specialty butcher shops charge up to $16 per pound for these "plate" short ribs. 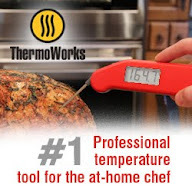 They are vacuum-sealed and are approximately 8-9 pounds. I couldn't resist and threw them in my shopping cart. 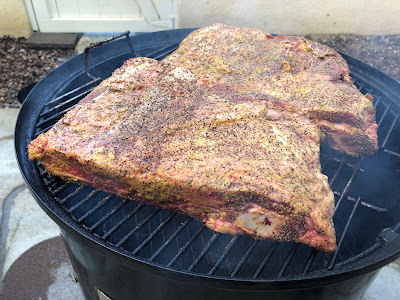 I already wrote about my experience smoking BBQ beef short ribs last year. 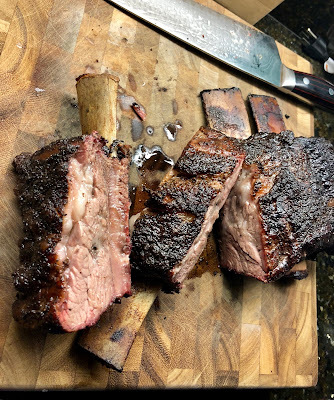 If you love BBQ and if you already have a smoker, the BBQ beef short rib is truly one of the best pieces of meat to smoke. 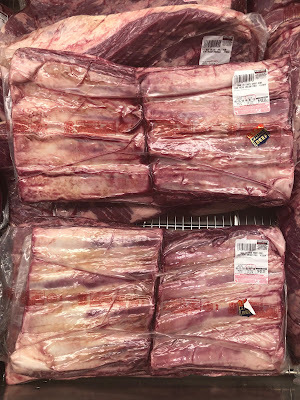 Short rib comes from the lower part of the ribs from the cow, and are usually cut into thinner and smaller pieces most often seen at the butcher shop from your typical grocery store. But when these beef short ribs are left uncut, or as "plated" beef ribs -- you can transform them into a monster short rib that is juicy, succulent, and full of beefy flavor. At many BBQ restaurants, if they happen to make these available, they charge anywhere from $25-30 PER rib. For about $45 at Costco, one package yields about 6-7 ribs. Since I love Texas-style BBQ, I used a simple salt and pepper rub and threw it on my Weber Smokey Mountain at 225 degrees F with pecan wood to give it a subtle touch of sweetness versus the heavier flavor of hickory. After about 3 hours, I took a peek at the ribs. You can see that the meat has pulled away from the edges of the bones. The edges started to caramelize faster than some other parts, so I made sure to rotate the grill so that the bark would form more evenly on all sides. After about 5 hours in the smoker, the internal temp of the beef ribs hovered around 190-195 degrees F, so I pulled them out of the smoker and wrapped the ribs in butcher paper to let the meat rest and for the juices to redistribute. It was agonizing to wait for about a hour, since I was hungry and it smelled so good! When I finally cut through the first rib, it exposed the slightly pink smoke ring as well as a slightly pink color throughout the meat from the hours of smoking. What makes the beef short ribs so good, so that there is very little fat wasted during and after the smoking process. Unlike the beef brisket, where you have to trim a considerable amount of fat before smoking, the fat is already dispersed throughout the ribs. The texture is very similar to the brisket point -- or the burnt ends of the brisket. The end result is a super juicy rib FULL of beef flavor, rendered fat with a subtle kiss of smoke. Plus, unlike the brisket, short ribs are very difficult to screw up and overcook. 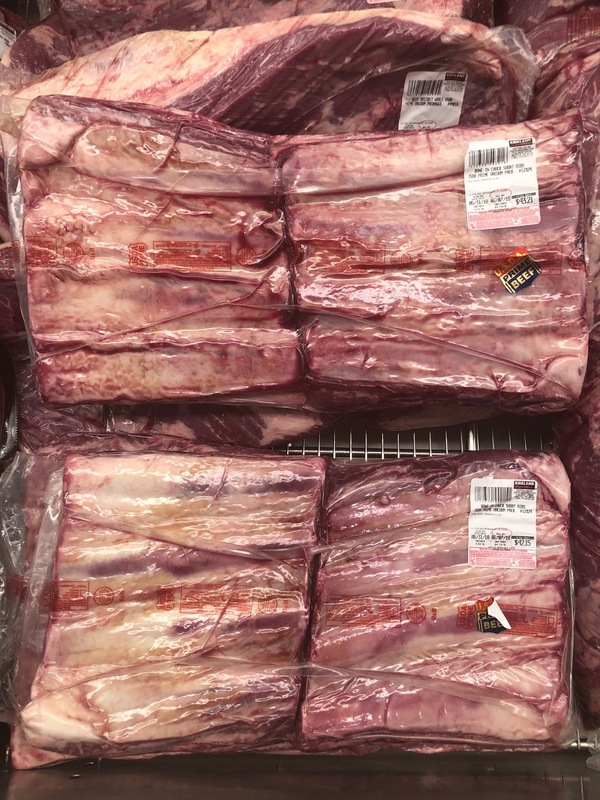 So the next time you see uncut beef short ribs at Costco, or anywhere else for that matter, pick them up! Everyone will want to be your best friend.